What's active listening, and why is it important for your career? Active listening is the process by which an individual secures information from another individual or group. The “active” element involves taking steps to draw out details that might not otherwise be shared. Active listeners avoid interrupting at all costs, summarize and repeat back what they have heard, and observe body language to give them an extra level of understanding. Active listening is a helpful skill for any worker to develop. It helps you truly understand what people are saying in conversations and meetings (and not just what you want to hear, or think you hear). During interviews, it can help you build rapport with your interviewer. Like critical thinking and problem-solving, active listening is a soft skill that’s held in high regard by employers. When interviewing for jobs, using active listening techniques can help show the interviewer how your interpersonal skills can draw people out. Active listening redirects your focus from what is going on inside of your head to the needs of your prospective employer or interviewer. That can help reduce your nervousness during an interview. By placing your focus, through active listening, squarely upon the interviewer, you prove that you: a) are interested in the organization’s challenges and successes; b) are ready to help them problem-solve work issues, and c) are a team player as opposed to being nothing more than a self-absorbed job candidate. It’s important to not interrupt, or worse, try to answer the question before you know what the interviewer is asking. Listen carefully to the interviewer’s questions, ask for clarification if necessary, and wait until the interviewer has finished talking to respond. There are plenty of active listening techniques that will improve the impression you can make at a job interview. Building trust and establishing rapport. Nonverbal cues which show understanding such as nodding, eye contact, and leaning forward. Asking specific questions to seek clarification. Waiting to disclose your opinion. Disclosing similar experiences to show understanding. 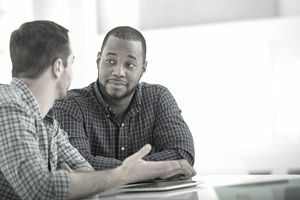 By employing these active listening techniques, you will impress your interviewer as a thoughtful, analytical, highly desirable candidate for the position. Think about possible situations that may occur during an interview and come up with strategies to allow you to listen actively. Never underestimate the power of “soft skills” (also known as “people skills”) like active listening, problem-solving, flexibility, self-motivation, leadership, and teamwork. Your CV or resume may look great, but don’t forget to nourish your soft skills. Especially for young, first-time job candidates with limited work experience, these people skills often are the deciding factor in whether an employer will be willing to take the risk in hiring them over others who may have more experience (but possibly weaker interpersonal communications talents). Don’t forget to highlight your soft skills in your interview (and even in your resume).